In the previous post about the heating system we talked about the fundamentals of the floor heating systems, their benefits & drawbacks and what were the decisive reasons for us to choose such a system above more conventional ones. Now the question is: where do we start? How many different heating zones do we need? and how much pipe? In this post we will walk through the steps to define the system. 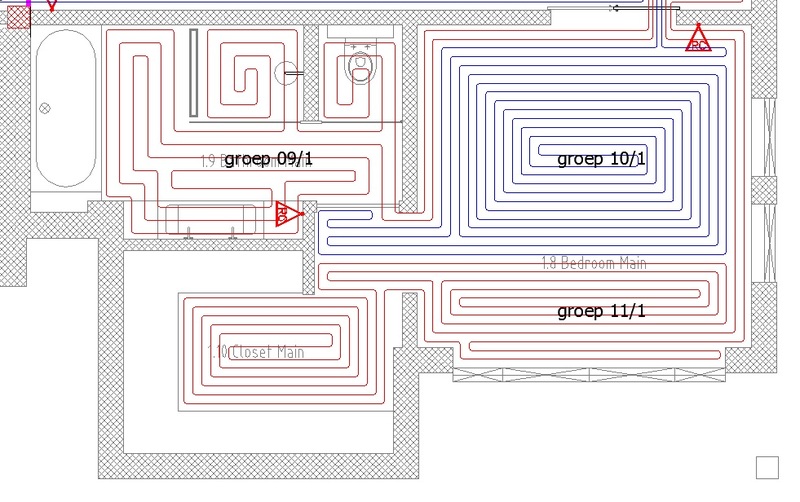 Before we can start laying the floor heating pipes we need two documents; a heat calculation and a laying plan. It is possible to prepare them yourself; there is quite some information about it on the various websites of floor heating manufactures. In our case, since we got our hands full with other projects concerning the house, we decided to subcontract this work to the installation company from which we bought the floor heating equipment. Nevertheless we have learned quite a lot from this process and we would like to share this with you in this post. The heat calculation is the first step for defining the floor heating system. Roughly said, it determines the required amount of energy to keep the house on the desired temperature. In order to carry out this calculation there are quite some variables that need to be provided. The first step is to determine the parameters of the house. The best way to do this is with a floor plan of the house and writing down the following description for each room: function, floor area, required temperature and the final floor type. Keep in mind that a bathroom has typically a higher temperature (22°C) than the living room (20°C). Storage areas on the other hand, have lower temperatures (10-15°C). Besides the room descriptions, it is important to provide a specification of the house itself in order to calculate the heat losses. This will determine the amount of energy needed to bring your house to the desired temperature. The specification should include information regarding the insulation values of the different walls (inner and outer walls), windows and floors. This data is quite easy to obtain for new build houses. For older houses a description of the wall configuration might be a better way to go. Usually the calculation company has a standard form to fill in all the data listed above and more. This information is then introduced in a calculation program which performs a heat balance calculation to determine the required energy. Based on the results of the heat balance, the company will advise on which type of pipes, manifold(s) and boiler meets the requirements best. The boiler should have enough capacity to provide warm water for the heating system but also for the bathrooms (shower and taps) and the kitchen (sink). In most cases the warm water requirements for the heating system are but a small fraction of the warm water needs of a house; therefore, the size of the boiler has to be selected looking at the broader picture. 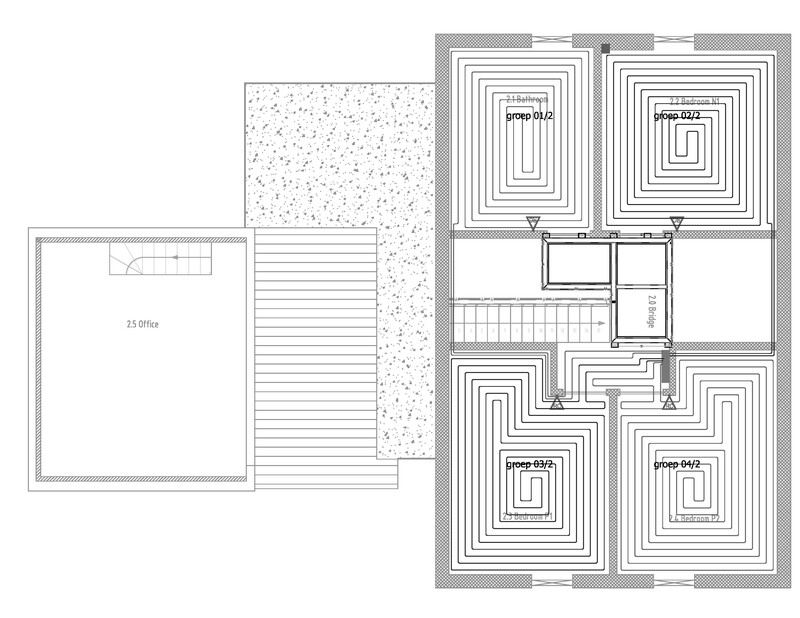 The laying plan is nothing more than a floor plan with the pattern of the floor heating pipes on it. During the installation of the floor heating system this drawing will become your best friend, as it indicates exactly where each pipe has to be laid. This drawing is not always provided together with the heat calculation; therefore it is important to specify your needs when contacting a floor heating manufacturer. The laying plan is based on the different heating zones that have been selected as well as on the data provided for the heat balance calculation. A heating zone is an area of the house in which the temperature can be controlled individually, like a bathroom for instance. Each heating zone will be provided with its own thermostat to control the temperature in that area. This way, rooms with similar uses or ambient temperature requirements can be gathered within a single heating zone and other spaces with distinct needs can be differentiated and controlled separately. Another decision that has to be made is the position of the floor heating manifold(s). Depending on the layout of the house and the floor area it might be necessary to install more than one manifold. In our case we chose to install a separate manifold for the upper floor. This reduced quite a lot the amount of piping we had to lay. The next step is to define the amount of groups that will be laid. The amount of groups is the amount of pipes that are connected to the manifold(s). Each group is formed out of one continuous piece of pipe (so no couplings in the floor!) and has its both ends connected directly to the manifold. The maximum pipe length of one group is about 100m. This is related to the heat transfer of the water in the pipe. In other words, after running over 100m, the water is no longer warm enough to radiate heat to the room and therefore loses efficiency. In addition, the drag forces in the pipes may become too high for the power of the pump on the manifolds. Because of these reasons, the floor area of the house has a direct effect on the amount of groups that are required: the larger spaces, the more meters of pipe will be needed and thus more groups. See an example on the second picture. It displays the living room and library of the house. These spaces belong each of them to a different heat zone. The library, since it is a small space, only requires one group (group 8), whereas the living room has a larger area and therefore it requires 3 groups (group 3, 4 and 5). At this point is where the real puzzle begins. The designer has to prepare a laying pattern which heats the floor evenly but keeps the pipe length below 100m. The density of the laying pattern will be influenced by the desired ambient temperatures and the proximity to areas where heat losses occur, such as near windows and doors. As you can see, the design of a lay plan requires plenty of information to be considered simultaneously; hence it is one of the tasks that is it always best to have it done by professionals. The last picture (see bottom of the post) shows the master bedroom, walk-in closet and en-suite master bathroom. In this case we have 2 heat zones: bathroom and bedrooom-closet. The second zone contains 2 groups due to its bigger dimensions. Note the difference on the density of the pipes between each zone. This is related to the distinct ambient temperatures and the heat losses of each room. On the next post of the floor heating series we will be discussing the different materials required to install the heating system and where to find them. 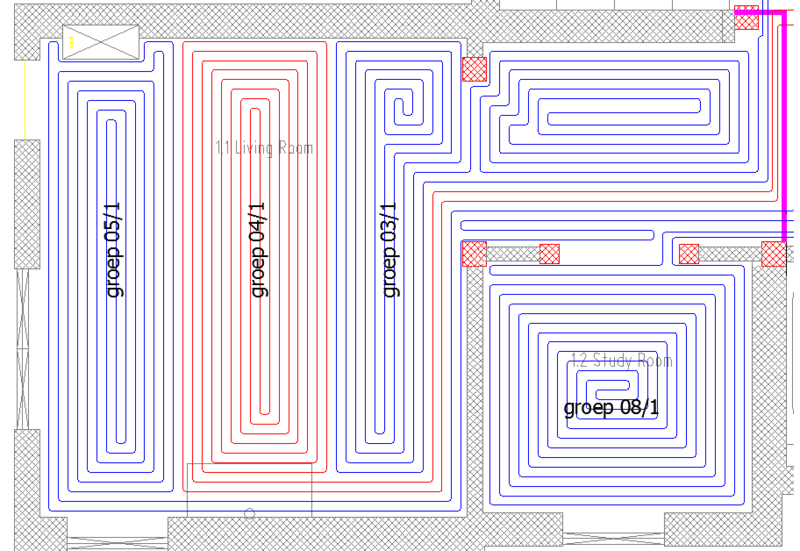 Did you expect the floor heating plan to require so much information? 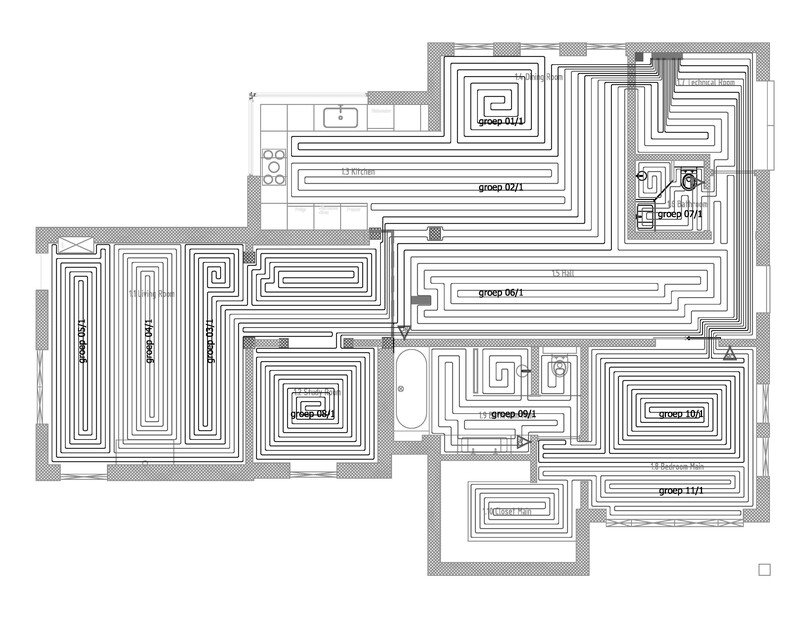 Do you feel confident enough to do the design of your floor heating system yourself? Let us know if you have any questions or need additional information. En la publicación anterior acerca de los sistemas calefacción radiante hablamos sobre los fundamentos de los suelos radiantes, sus ventajas y desventajas y sobre cuáles fueron las razones por la que escogimos este sistema por encima de los convencionales. Ahora la pregunta es: ¿Por dónde se empieza? ¿Cuántas zonas de calor necesitamos? ¿Y cuántos tubos? En esta publicación hablaremos de pasos a seguir a la hora de definir un sistema suelo radiante. Antes de comenzar a instalar los tubos en el suelo son necesarios dos documentos: el cálculo del balance de calor y el plano de tendido de tubos. Es posible preparar estos documentos uno mismo; las páginas web de los fabricantes de suelos radiantes suelen contener mucha información acerca de cómo diseñar estos sistemas. En nuestro caso, dado que teníamos múltiples proyectos simultáneamente entre manos, decidimos dejar este cálculo en manos de la empresa suministradora de los materiales. Aun así, en esta publicación queremos compartir lo que hemos aprendido durante este proceso. El cálculo del balance de calor es el primer paso a la hora de definir el sistema de calefacción radiante. En pocas palabras, este cálculo determina la energía necesaria para mantener la casa a la temperatura deseada. Para poder llevar a cabo este cálculo es necesario aportar una serie de datos. El primer paso es determinar los parámetros de la casa. La mejor forma de hace esto es coger un plano general de la casa y escribir sobre casa estancia una breve descripción de la misma: función, área, temperatura deseada y tipo de suelo. Hay que tener en cuenta que cada habitación requiere diferentes temperaturas. Por ejemplo, en los cuartos de baño es deseable una temperatura de unos 22ºC mientras que el salón o comedor 18-20ºC son suficientes. Por otra parte, las áreas de almacenamiento no requieren temperaturas superiores a 10-15ºC. Además de las descripciones de casa estancia, es importante proporcionar una especificación sobre la casa para poder calcular las pérdidas de calor. Ello determinará la cantidad de energía necesaria para mantener la casa a una temperatura confortable. La especificación debe incluir información relativa a los valores de aislamiento de las paredes (tanto externas como internas) y la posición de las ventas y puertas. Para casas de nueva construcción esta información suele ser fácil de encontrar. Para casas más viejas, es mejor proporcionar una descripción de la configuración de los muros y paredes. Normalmente la empresa que realiza los cálculos facilita un formulario donde se pueden rellenar todos los datos descritos arriba y algunos más. Esta información es introducida posteriormente en un programa de cálculo para estimar la energía necesaria. Posteriormente, en base a los resultados obtenidos, la empresa proporcionará asesoramiento sobre el tipo de tubos, distribuidor(es) y caldera que mejor se adapta a las necesidades. No hay que olvidarse de que la caldera deberá tener suficiente capacidad para suministrar agua caliente tanto al sistema de calefacción como a los baños (ducha y lavabos) y cocina (fregadero). En la mayoría de los casos, los requerimientos del suelo radiante son tan solo una pequeña fracción del agua caliente que la casa necesita; por ello, la caldera debe de ser elegida considerando la totalidad de los sistemas. El plano de tendido de tubos no es más que el plano de la distribución de la casa con el patrón de los tubos del suelo radiante en él. Durante la instalación del sistema, este plano será tu mejor amigo, ya que indica exactamente dónde deben de ser colocada cada sección de tubería. Las empresas que realizan los cálculos de balance de calor no siempre suministran el plano de tendido adjunto, por lo que es aconsejable precisar que se desea este documento a la hora de contactar con la empresa. Este plano se basa tanto en las diferentes zonas de calor que han sido seleccionadas como en los resultados del cálculo del balance de calor. Una zona de calor es un área de la casa que puede ser controlada individualmente, como puede ser un cuarto de baño. Cada zona de calor estará provista de un termostato independiente con el que se controlará dicha área. De esta forma, las estancias con unos o temperaturas ambiente similares podrán ser agrupadas bajo la misma zona de calor mientas que los espacios con necesidades distintas pueden ser diferenciados y controlados separadamente. Otra decisión que hay que tomar es la posición del distribuidor. Dependiendo de la distribución de la casa, puede que sea necesario instalar varios distribuidores. En nuestro caso, decidimos instalar un distribuidor auxiliar para las zonas de la primera planta. Ello redujo considerablemente la cantidad de tubos a tender. El siguiente paso es definir los grupos que serán tendidos. El número de grupos es el número de tubos individuales que están conectados al distribuidor. Cada grupo está formado por un único tubo continuo (no se admiten acoplamientos) cuyos extremos están conectados al distribuidor. La longitud máxima de casa grupo es más o menos 100m. Esto está relacionado con la transferencia de calor del agua caliente en el tubo. En otras palabras, a partir de los 100m, el agua deja de estar lo suficientemente caliente como para radiar calor a la estancia y por ello pierde eficiencia. Por otro lado, la fricción dentro de los tubos puede resultar superior a la potencia de la bomba de los distribuidores. Por estas razones , el área de la casa está directamente relacionada con el número de grupos necesarios: cuanto mayor sea la casa, más metros serán necesarios y por ello mayor número de grupos. Ver el ejemplo de la segunda foto. En ella se puede ver el salón y la biblioteca de la casa. Cada estancia pertenece a una zona de calor diferente. La biblioteca, al ser un espacio relativamente pequeño, solo requiere un grupo (grupo 8) mientras que el salón, debido a su mayor tamaño, necesita 3 grupos diferentes (grupo 3, 4 y 5). Una vez que todos los parámetros están definidos es cuando comienza el rompecabezas. El diseñador debe preparar el plano de tendido de manera que el suelo radiante caliente la estancia uniformemente y manteniendo la longitud de cada grupo por debajo de los 100m. Por otro lado, la densidad de del patrón dependerá de la temperatura ambiente deseada y de la proximidad de zonas donde existen pérdidas de calor, como pueden ser ventanas y puertas. Como puede verse, el diseño del plano de tendido requiere considerar una multitud de parámetros simultáneamente; por ello es preferible que esta tarea sea realizada por profesionales. La última foto corresponde al dormitorio principal, vestidor y cuarto de baño de la planta baja. En este caso tenemos 2 zonas de calor: cuarto de baño y dormitorio-vestidor. La segunda zona está compuesta por dos grupos debido a su tamaño. Nótese la diferencia de densidad de los tubos en ambas zonas. Esto se debe a las diferentes temperaturas ambiente y también a las pérdidas de calor de cada estancia. En nuestra siguiente publicación en la serie de suelo radiante hablaremos de los diferentes materiales que son necesarios para la instalación del suelo radiante y dónde encontrarlos. ¿Esperabais que el sistema de suelo radiante necesitara tanta información? ¿Creéis que podríais diseñar un sistema de suelo radiante vosotros mimos? Si tenéis preguntas o queréis más información, no dudéis en poner en contacto con nosotros. This entry was tagged Calculations, Construction, diy, floor heating, Installations. Bookmark the permalink.